Wouldn’t it be nice if there were a rulebook you could check for every money decision you were struggling with? Well Jean Chatzky wants to help you with that. She recently came out with a new book called “Money Rules” that’s different than your average personal finance book. It’s a collection of the money rules she follows and has spent the last 20 years developing on the personal finance beat. 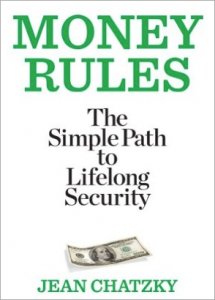 There are 94 rules organized into sections: Make Money, Save Money, Avoid (Most) Debt, Spend Wisely, Invest for Tomorrow, Cover Your Assets, Do’s and Don’ts. The rules are short, each just a sentence or two. She follows most of the rules with a paragraph or two that goes into more detail. None of the rules and the accompanying description are more than a page long. I like how she kept each one short and concise, this actually allowed her to do something a little different with the layout of the book. The actual dimensions of the book are pretty small. I was able to slip the whole thing into the pocket of my shorts when I took my kids to the park and browse the rules as they were running around the playground. I like the idea that not only are the rules short and easy to remember, but you can also take the book along with you and refer to it when you need it. The rules Jean lists out are good ones to follow. Some are common sense and seem rather obvious. Other are kind of neat, that you might not think of off the top of your head, and so they’re kind of neat little useful nuggets. Know your worth on the open market. More money won’t always make you “more happy”. There’s no such thing as chump change. Financial plans don’t fail, people fail. Saving is more important than investing. Doing nothing can be very expensive. Just because someone will lend you money doesn’t mean you should borrow it. Just because you have a coupon doesn’t mean you should go shopping. The salesperson is not your friend. In any transaction, ask “what’s in it for them”? Nobody cares about your money as much as you do. If you can’t figure out what an investment (or advisor) is costing you you’re overpaying. If there’s a bandwagon you’re too late. Date your stocks, don’t marry them. The market doesn’t make mistakes, people do. The harder the sell, the faster you should run. Spend more time building a legacy than an inheritance. Don’t lend money to friends and relatives. This book is a short read because it’s pretty small. It’s one of those books that you can actually read a little bit at a time, each page is a lesson in itself. You can stuff it in your pocket or purse, and just pull it out when you are standing in line or sitting in the waiting room. If you sit down and read it all at once you can get through it pretty quickly. One cool way to do it would be to read a rule a day. So over a 94-day period you could absorb one rule each day – you could read the rule multiple times to have it stick with you. I really like Jean’s approach to this book – it kind of reminds me of the book “Eat This, Not That” that helps you decide what you should or shouldn’t eat when you’re out at a restaurant. Money Rules does something similar for your money. If you’re out shopping you can quick flip to the spending section if you’re debating something and read the rules to help decide whether you should buy it or not. Being able to take a complicated and lengthy subject and simplify them into small concise explanations and rules is a talent. I think what Jean has done, taking her years of experience in the personal finance world and consolidating it into this valuable set of rules, is a very useful thing for readers and I would recommend that you check out the book. I think I disagree with this one. The market makes mistakes on a daily basis (panic selling, speculation, etc). People do make mistakes in the market, however one of the biggest ones is assuming that the market doesn’t make mistakes and acts rationally. Well Jerry – You’d better not purchase Jean’s book because guess what — she’s selling something: her book. If you really think all sales people only have their interest at heart, and never the client’s, that’s sad — and not true. Sure in some cases it is, but there are bad apples in every vocation, but it’s simply wrong to paint a whole group of people with the same brush. Remember: nothing happens until someone sells something. GREAT rules!! Beware of anyone selling anything (insurance, annuities, anything) because they do not have your best interest at heart.